The variety and range of sauces that can be served with pasta are seemingly endless. They vary from minimalist sauces, such as garlic and olive oil, to light vegetable sauces, shellfish sauces, robust meat sauces, and rich and creamy sauces containing eggs, cheese and nuts. When choosing the appropriate pasta shape for a sauce, there are no hard and fast rules. Some regional dishes are always made with the same pasta shape, such as fettucine all'alfredo, tagliatelle bolognese and penne all'arrabbiata, and it is rare to see them served with anything other than the named pasta. These classic dishes are few and far between however and, with the increasing number of different pasta shapes on the market it can sometimes be difficult to know which shapes and which sauces will go well together. Long, thin pasta is best served with either a thin, clinging sauce, or one that is smooth and thick. If too thin and watery, the sauce will simply run off the long strands; if too chunky or heavy, it will fall to the bottom of the bowl, leaving the pasta at the top. Clinging sauces made with olive oil, butter, cream, eggs, finely grated cheese and chopped fresh herbs are good with long pasta. When ingredients such as vegetables, fish and meat are added to a smooth thick sauce, they should be very finely chopped. Short pasta shapes with wide openings, such as conchiglie, penne and rigatoni, will trap meaty or spicy sauces, as will spirals and curls. Egg pasta has different properties from plain pasta and goes especially well with the rich creamy and meaty sauces that are popular in northern Italy. Fresh homemade egg pasta absorbs butter and cream and makes the sauce stick to it. Almost any pasta is suitable for the classic Italian tomato sauce. Chop all the vegetables (hold the parsley) very fine and sauté them in the olive oil until translucent. Add the ground beef. Stir well and cook for about five minutes or until the meat is separated and browned. Add the tomato paste and mix well until all the ingredients are coated. Add the wine (optional) and the salt and pepper. Cook for few minutes more, then add about a cup of water (or broth). Bring to the boil, then reduce the heat and simmer on a low heat, until reduced. Note: add a bit more liquid if you think it's too dry. Heat 1/2 the oil in a large saucepan. In batches, cook the meat until lightly browned. Remove from the pan. Add the remaining oil, onion, garlic, carrot and celery. Cook until light brown and soft. Return the meat to the saucepan. Add pasta, tomatoes, stock, wine, parsley and sugar. Season with salt and pepper. Simmer, stirring often, for 1½ hours on a medium-low heat. Remove any large meat or vegetable chunks. 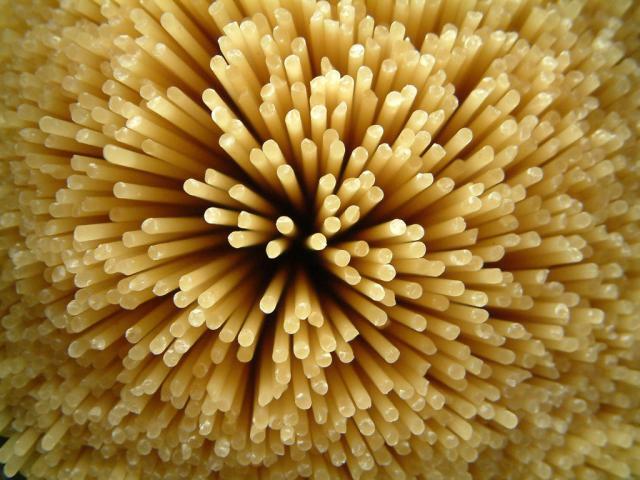 Stir through cooked pasta. Serve topped with parsley.